cobbrehabwellness.com: Text neck! What is it, why we get it and how we can prevent it. Text neck! What is it, why we get it and how we can prevent it. 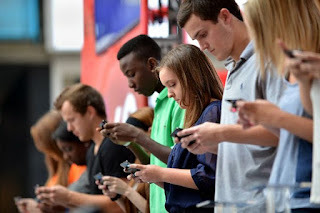 Text Neck is the term that is used in reference to the pain and damage sustained from looking downward, generally at a cell phone or hand held device, too frequently and for too long. This is becoming quite an epidemic with more technological advances every few months, we have more and more reasons to be on our devices. Not just with teenagers and young adults, but the majority of people across the country are experiencing an increase in neck pain due to overuse of cell phones, tablets, computers, etc. The average adult uses their smartphone for 2 to 4 hours a day which can add up to around 700 to 1400 hours per year - and for teenagers? Up to 5000 hours a year is spent on mobile devices! An average adults' head weighs between 10 and 12 pounds, and tilting your head forward even just 15 degrees can increase pressure on the neck by 27 pounds. This increases with every inch your head is tilted forward. How can we treat the symptoms of Text Neck? Well, prevention is the best option along with discontinuation of looking down at your phone. Try to use your hand held devices at eye level to avoid tilting your head to far. Most importantly, once the pain starts, go get it worked on. At Cobb Rehab and Wellness we treat neck and back pains and help get you back to being pain free. For more information on prevention click here and to book your next appointment with us visit our website at www.cobbrehabwellness.com .